It seemed like the day flashed by today. The morning went by quickly. Before you knew it it was lunch, nap, then go pick Darcy up from school and head off to see some friends and their newborn baby. So not much was accomplished. Hopefully will at least try to finish a sketch by tomorrow. Met a cute little friend last night. 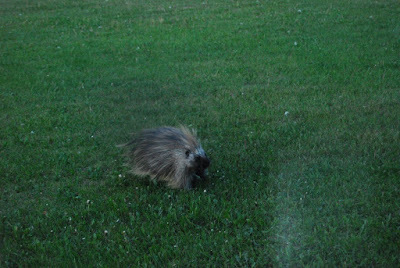 After Darcy and I put the boys to bed we saw this porcupine outside our picture window coming towards us. Of course I brought out the camera right away since it's the first time, beside the roadkills, I've ever seen a wild porcupine. Darcy said it was only a wee little guy. Wonder where it's parents were? I managed to snap some shots through our window, but the glare was pretty bad. Darcy told me to go outside, I was of course hesitant. Being the city girl that I am, not knowing much about animals, I thought it would shoot quills at me. Darcy leading the way, I went outside and tried to shoot some closer pictures. Unfortunately it was getting dark and my lens are only 18-55mm zoom. Hmm, got to put new lens on my wish list! 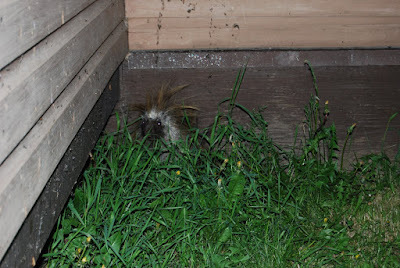 The poor porcupine was so scared it quickly showed us it's quills. That had to be the most amazing thing I've seen in a while. Can't believe how deadly a cute little thing can be. What a cute little guy! Thanks for visiting me! Thanks for checking out my site! You're awesome!